By combining lean manufacturing with enterprise resource planning (ERP) software, manufacturers can reap the benefits of smaller inventories, faster time-to-market and reduced overhead without sacrificing production quality or product availability. After all, when implemented correctly, ERP software helps manufacturers avoid surplus inventory, eliminate stock-outs, deliver the right product to the right location, and stay abreast of new buyer behaviors and trends. Similarly, lean manufacturing is designed to cut the fat out of the manufacturing process, ending the tie-up of valuable resources in obsolete or unnecessary work in progress (WIP), inventory and finished products. "The reality is, unless you’re running a fairly small or simple organization without a complex product, it’s not practical to run a manufacturing company without a dedicated business software application. I could be running the leanest place around, but I’ll still need an ERP system, even if I don’t use it out on the shop floor," said Jim Shepherd, senior vice president of research at AMR Research. ERP software uses scheduling algorithms to predict the quantity and timing of the resources required to build the finished products. Using an ERP system, management can forecast the necessary manpower, cash and materials required to generate products. These predictive tools are vital to the health of today's manufacturers, which face an ongoing onslaught of competition locally and abroad. Without an ERP solution, businesses will find it exceedingly challenging to track and analyze operations to determine which processes can improve and how to address this need, said Shepherd. "ERP organizes the information you need about products, production, facilities, resources and demand," he said. "You need this [information] to implement lean manufacturing, so having it organized in a single place of reference is very valuable." But if businesses do not link their ERP system with lean manufacturing, they still may face surplus inventory which, in turn, causes them to predict further into the future creating frequent order-changes and large lot sizes, while at the same time contributing to stockouts and obsolete inventory. The answer: Combine lean and ERP technologies and methodologies in order to streamline and power-up your operation. Lean manufacturing focuses on ridding a company of waste throughout the production process, enabling manufacturers to save money and enhance productivity. 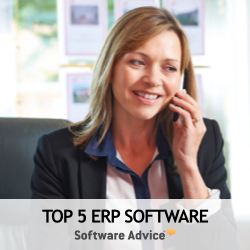 ERP software empowers an organization to infuse the entire business with lean principles, eliminating excess resource allocation and spending company-wide. Some ERP software developers tout their products as "lean-enabled," meaning the application has features that allow a manufacturer to embody the lean philosophy. Today, most ERP systems incorporate support for the key lean principles of value definition and specification, uninterrupted flow, customer pull , value stream mapping and the pursuit of perfection. For example, after using a pull model in QAD ERP's supplier visualization component, Caterpillar reduced the amount of inventory not meeting target levels by 10% and cut order lead time by 50%. The heavy-equipment manufacturer also cut two staff from running the manufacturing operation while simultaneously increasing the site's capacity, according to a published report. Alone, Enterprise Resource Planning software does not create a lean manufacturing environment. Rather, ERP supports a company's lean manufacturing aspirations. During the careful pre-ERP implementation scrutiny, you should have identified processes and departments that can improve operations, potentially by combining ERP's strengths with the steps required for a true lean manufacturing environment. During the Caterpillar process IT worked closely with engineers and manufacturing executives to identify needs, wants and processes to eliminate. This discovery process, combined with company-appropriate ERP software modules and features, create the catalyst to empower your company's lean manufacturing efforts - and the many sustained benefits this business model delivers. Today, most ERP systems incorporate support for the key lean principles of value definition and specification, uninterrupted flow, customer pull, value stream mapping and the pursuit of perfection.